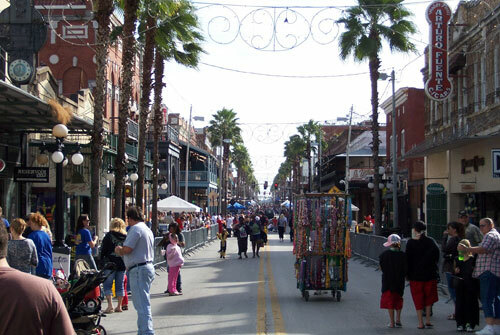 A walk down 7th Avenue in the historic neighborhood of Ybor City in Tampa, Florida, engages all the senses. From the scent of roasting coffee, sights of towering palm trees, and sounds of Latin music, a stroll down "La Setima" or "Broadway," as residents know it, evokes a dream-like experience. "The ambiance is that of a European City," says lifetime resident Fran Constantino, "and the architecture of the buildings reflects that. La Setima is a jewel for Florida and the nation." Seventh Avenue is designated one of the American Planning Association's (APA) 2008 Great Streets in America for its history, character and strong community involvement. The designation encompasses 11 blocks between 26th Street to the east and the Nick Nuccio Parkway to the west. The Spanish and Italian architecture along 7th Ave is enhanced by the wrought iron balconies and street furniture reminiscent of European styles. Photo Courtesy of Tony LaColla, AICP. Seventh Avenue's origins date to 1885 and are linked to Ybor City's role as the cigar manufacturing capital of the world, which continued through the late 1950s. More than 230 factories were located here, and at the heart of the industry was 7th Avenue. Spanish, Cuban, African, Italian, German, Jewish, and other immigrants who arrived at the beginning of the 20th century created strong social networks and clubs along the street. The Jim Crow laws and "whites only" rules that dominated the South up until the mid-1960s didn't apply here; everyone could shop and eat in the same places. This ethnic heritage also is evident in the storefronts with second-story apartments and other buildings fronting 7th Avenue. Italian and Spanish architectural features dominant, including second-floor balconies, ornate cornice work, and intricate tile designs. Historic five-globe street lamps line wide sidewalks of hex-shaped pavers. Shop windows are decorated with works of local artists. Wrought iron benches offer inviting places to sit and people watch or have a cup of cafe con leche and Cuban toast. At night, thousands of small white lights illuminate ornate curlycue light fixtures. These defining qualities were almost destroyed during the late 1950s and 1960s when 93 percent of Ybor City was transformed through federal urban renewal efforts aimed at slum clearance and interstate freeway construction through neighborhoods and downtowns. Residents like Tony Pizzo, founder of the Tampa Historical Society and whose parents owned a grocery store on 7th Avenue, fought proposals that would have caused buildings to be leveled. Others joined in, and in 1959 the Barrio Latino Commission (BLC) was created. This was Tampa's first architectural review commission, modeled after the Vieux Carre Commission in New Orleans, and created to protect what buildings and neighborhoods were still intact. 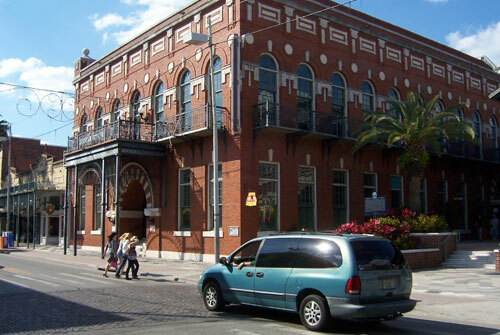 Chartered on September 7, 1891, the 7th Ave Centro Espanol Social Club was the first Latin club organized in Ybor City. The red brick edifice reflects the French Renaissance Revival style with Moorish and Spanish influence. Photo Courtesy of Tony LaColla, AICP. The area's tradition of civic participation and community involvement in planning and preservation has continued. 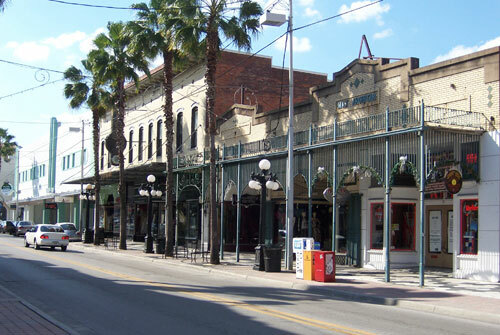 The 1983 Ybor City Historic District Revitalization Plan led to more than $12 million in private investment along the street and elsewhere in the city. Current redevelopment efforts along 7th Avenue and the surrounding area is guided by the 2004 Ybor City Vision Plan. Improvements to the street itself include a recently completed stormwater system to manage runoff from new development and protect the community against damage from storms and hurricanes. Also, 7th Avenue's first LEED-certified building is under construction. Seventh Avenue is not just a street, says Ybor City lifetime resident Vince Pardo, but a community living room with all of the elements needed to create what planners call a "sense of place." The Guavaween celebration on 7th Avenue is one of the premiere Halloween events in the U.S. Nearly 100,000 participants come out for Family Fun Fest during the day and Guavaween at night. Photo Courtesy of Tony LaColla, AICP.